Yuri Falik has made little enduring international impression - very much a St Petersburg figure as things stand. Odessa-born, he wrote, amongst much else, Oresteia, a choreographic tragedy (after Aeschylus), Light Symphony for orchestra, Violin Concerto, eight string quartets, Symphony No. 2 Kaddish (1993), and Mass for soloists, chorus, and chamber orchestra (1996). His Cello Concerto Concerto della passione is heard here in a tense recording made in concert. Coughs and shuffling are in evidence between movements and elsewhere. Falik, who was himself a cellist product of Rostropovich's classes at the then Leningrad Conservatory, also graduated as a composer. His teacher was Boris Arapov. 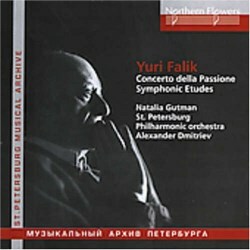 Natalia Gutman is the eloquent yet not over-emotional soloist on this disc. She responds well to the Concerto's dignity and is recorded at a natural distance from the orchestra. The music veers between cackling demonic (Dies Irae) and disconsolate clouds (Lacrimosa). The finale is a gorgeously impressive and mystical Lux Aeterna with a mesmerising velvety chime - rather akin to Allan Pettersson but without the groaning discontent. Overall the work has a gripping religious intensity without the extremes, each in their own way, of Silvestrov, Artyomov or Zhukhov. From eleven years earlier the shorter Second concerto for orchestra (Symphonic Etudes) also combines elements of pulse-slowing meditation with clangourous display. The soundworld Falik establishes is inventive with some hissing Ravel-like delicacy. This races away into buzzing urgency and raw whooping jubilation. It's a shame that the two works are set down each in a single track even though each is in four movements. The notes by Ekaterina Ruchievskaya provide helpful background to each piece and more generally. They are not overly technical - all to the good - and are in English and Russian cyrillic. This is not music showing any debt to Shostakovich neither is it thornily avant-garde or hieratic-arcane. It presents a fresh-faced sound which draws deep on beauty, mystery and brilliance. It does so in a listener-accessible way without being facile.